Kitchen Fund is investing in the chain by helping it build an infrastructure that will enable The Hummus & Pita Co. to start franchising. Janice Axelrod founded The Hummus & Pita Co. in 2011, based on her recipes, and got her family involved, including her sons, David and Steve Pesso. The kids grew up eating hummus and pita. Axelrod had been involved in finance and owned a mortgage bank. She sold it in 2008, and dreamed of opening a restaurant. She put her recipes together and the family launched the restaurant. “She was in her mid-60s and said, ‘This is my dream, my last hurrah, and I want my family to be involved,’” Pesso said. The restaurant serves a menu from a mix of Mediterranean dishes — Greek, Turkish, Palestinian, Moroccan — including shawarma, gyros and 12 different flavors of hummus, along with steak and chicken made in a clay oven. The menu also includes vegetarian and vegan options. The family deliberately gave the concept a basic, Americanized name, with modern décor inside the restaurant. The first unit opened in 2012, in New York, with 2,200 square feet and 62 seats. Photo: The Hummus & Pita Co.
“It was a hit,” Pesso said. Just three months later, Dan Rowe showed up. Rowe then approached them and told them about Kitchen Fund. Rowe and Golkin, a financier who has worked with Goldman Sachs and Maverick Capital, among other places, started Kitchen Fund last year. They’ve made investments in a handful of startup concepts, including The Pie Hole, Mr. Holmes Bakehouse and Inday. They started the fund to make early-stage investments in restaurant concepts. Many of these concepts are in “a tricky part of the growth curve,” Golkin said, because they are too small to get institutional investor attention, but are too big for friends and family to help. “It’s harder money to raise,” Rowe said. Kitchen Fund’s goal is to identify concepts connecting with those consumers and to help them grow. 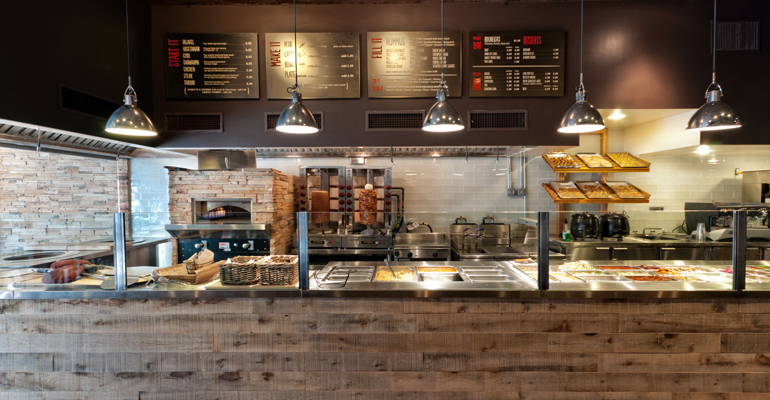 The Hummus & Pita Co. has completed its franchise registration documents, and is working with Fransmart to lure operators to the concept. Rowe said there are franchisees already interested in the brand.